I know that T-Mobile data coverage is not extensive outside of major cities. I'm interested in understanding how well the cell coverage is for making calls in the U.S. I'm currently with Sprint. In general cell coverage is good where I travel, but I'm tired of waiting forever for promises of improved data speeds. I'm in San Diego where 4G LTE is rolling out, and I'm not impressed. I've been to Dallas where 4G has been available for awhile, and even there its just okay and not available everywhere. If I switch (2 lines) I want to make sure I'm moving for the better on data, and not losing cell coverage. Thanks. Also I drove from Jacksonville FL to Merchantville NJ and while I had edge data when not in a major town on the drive I never once couldn't text of call someone.. Always had that. It really varies with T-Mobile. I know there's a site that show the number of cell tower for each carrier by zipcode. I don't have the link right now. I've used AT&T most of my life, and just switched back to T-Mobile last fall due to their new rates. 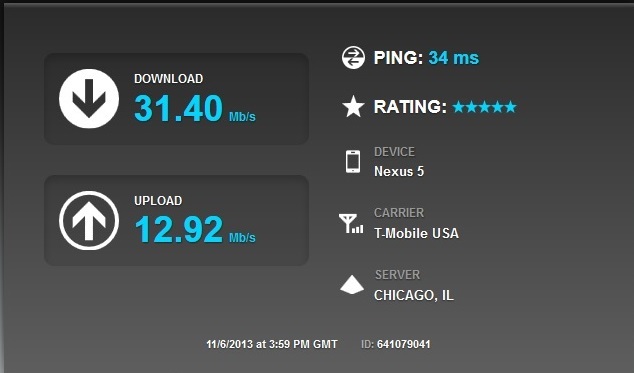 I am in Chicago and T-Mobile has good coverage in Chicago, but if I drive over to Indiana it's real sporadic. AT&T does have better coverage nationwide. I would look at T-Mobile's coverage maps. They are fairly accurate. If it says you have voice coverage somewhere, you have voice coverage there. Also, if you are switching, it probably means you will be on one of their Simple Choice plans, which gives you a good level of voice roaming (as well as some data roaming). The best would be to try it out yourself. There are apps like Root Metrics that can give you average data speeds but accuracy really depends. I checked at my work and I get at least 20 times the data speed shown on the Root Metrics app for my work. Thanks! That's what I was interested in. Being able to call and text in areas outside of major cities. And on a drive, I'm likely in need of Google maps, which an edge connection I'm assuming can handle. Thanks for the responses. I've looked at a few coverage maps other than the one from T-Mobile. They are helpful, but only as good as the data they have collected from users, so they don't always tell the whole story. The nice thing about T-Mobile is that you can just test it out and then cancel any time without penalty. If you get a new phone through T-Mobile, you can return it within 14 days with no restocking fee, as long as you're cancelling service. If you already have a phone that is compatible with T-Mobile's network, you could also just start a plan with them and get the SIM card to insert into your phone. Then set up your current phone number to forward calls to your temporary new T-Mobile number so that you don't miss any calls. If you like T-Mobile, then tell them to port your current number over. AT&T: When is open enrollment for mobile insurance? How do you wake the screen while on a call?